The Los Angeles-based 20-something, multi-instrumental trio of sisters, Este Haim, Danielle Haim, and Alana Haim along with Dash Hutton on drums that comprise the rock/pop band HAIM have been generating quite a buzz since their first EP Forever was released early last year. Plenty of comparisons have been made with Fleetwood Mac, and whilst the album has some elements of that ’70s pop/rock magic Fleetwood Mac is known for, Days Are Gone have more in common with Stevie Nicks’ solo work. Full of ’80s synth, percussion heart thumping beats and fun pop sensibilities. Singles, “Falling,” “Forever,” “Don’t Save Me,” and “The Wire” have been making us hungry for more of what HAIM has in store. And with this week’s release of their highly anticipated LP Days Are Gone, our appetites finally get satiated. They’ve released an album full of fun pop ditties, culling from influence from the ’70s, ’80s, ’90s, and R&B (but mostly the ’80s). Dare you not to dance to “If You Could Change Your Mind” which would be at home in any John Hughes movie circa 1989. 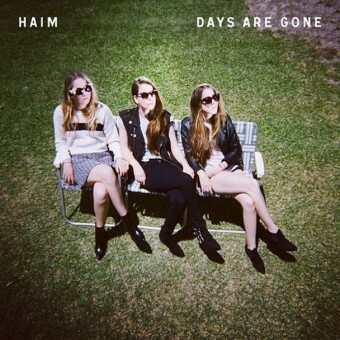 Days Are Gone is an album marbled with melodic pop gems and the HAIM sisters were right in delaying its release until they felt it was ready for consumption. And boy, was it worth the wait.